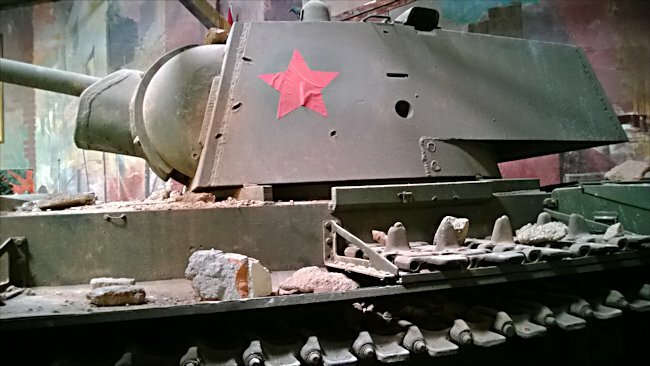 This Russian Soviet WW2 KV-1 Heavy Tank can be found at the French Tank Museum in Saumur in the Loire Valley. The Museum is called Musée des Blindés ou Association des Amis du Musée des Blindés, 1043, route de Fontevraud, 49400 Saumur, France www.museedesblindes.fr . The word Blindés means armoured. Russian Soviet WW2 KV-1 (Klemanti Voroshilov) Heavy Tank. It is displayed in the Museum as if it has been knocked out. Look at the missing track. The KV-1 Russian Heavy Tank was one of the first great Soviet heavies. KV stands for Kliment Voroshilov after the Russian commissar in charge of defence. In some ways the KV1 has been eclipsed by the legendary T34 general purpose tank which came soon after. The KV1 was a formidable beast in its own right. It came as a big surprise to the Germans when they invaded Russia in 1941. Back then the KV1 heavy tank could out fight any German tank on a one to one basis. Just as important most German Anti-Tank Guns could not stop it either. There is no substitute for thick armour. The KV-1 heavy has plenty of it. There is between 75m to 90mm on the hull front an turret. 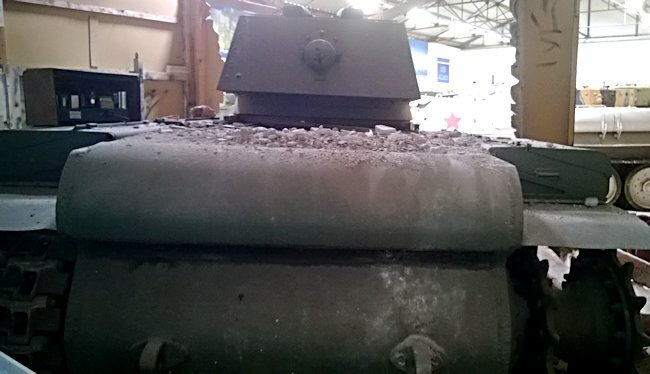 The KV-1 B that can be seen at Bovington Tank Museum has the slightly thicker armour. 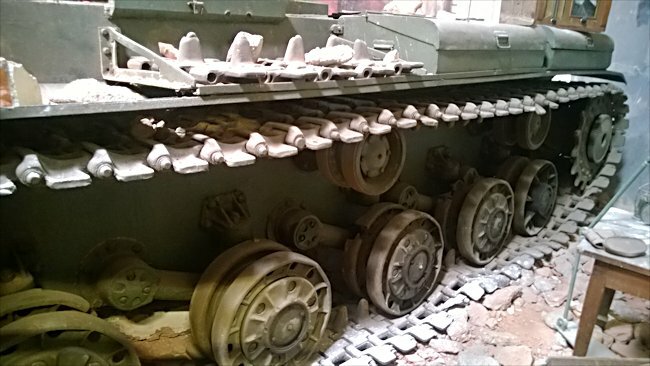 At the time of the German invasion of Russia no German tank's Gun had the power to penetrate the front armour of this tank. Even the Panzer Mk4 with its short barreled 75mm gun could penetrate 50mm of armour at 500 meters. On the other hand the KV-1's 76.2 mm gun could penetrate between 70mm to 90mm of armour. It could easily penetrate the 50mm frontal armour of the panzer Mk4 which was then the heaviest tank the Germans had. To give you the true measure of this tank on the battle field in August 1941 barely two months after the first attack, a column of the German 8th panzer drove into a well-planned ambush by five KV-1s near Leningrad. After two hours a total of 43 German tanks had been knocked out by these five RussianKV-1 heavies. The advance was stopped dead. One of the KV-1s received a total of 135 hits. Not a single German shell penetrated the armoured defence let alone disabled it. Despite this amazing record the KV-1 was not a completely good tank. This is mainly because the design of the crew arrangement was not ideal. There were five crew in total. The Driver sat front centre and to his left sat the radio operator, who also was responsible for firing the 7.26mm machine gun. No real problems so far, but it was the construction of the turret that caused the main difficulties. In most tank turrets of the time, turrets had a tank basket or floor on which the crew stood. This meant that as the turret turned the crew would be transported along with it. The KV-1 had no turret basket so when the turret moved the Commander, Gunner and assistant driver/mechanic had to shift themselves around with it. The Commander also had too many things to do. Not only did he have to command the tank by directing it over the battlefield, looking for targets and threats, he also had to load the main gun and fire the co-axel machine gun. As if this was not enough of a problem, the tank lacked an all-round vision cupola. The KV1-B's gun was good. The 76.2mm ZIS 5 was almost identical to the Gun fitted to the T34. Right from the start there was a variant of the KV1 known as the Large Turret KV but later designated the KV-2. The KV-1's engine was excellent for its time. It went on to power the T34 medium tank as well. It was a 38.8 litre V-12 550hp diesel. This gave this brut of a tank the road speed of 34 km/h and a cross country speed of 16 km/h. It had a better range than the smaller German Panzer IV. The suspension was taken from an earlier Russian tank , the twin turreted SMK39 of 1939. It used torsion bar suspension. A system the Germans would later copy and use on their Tiger and Panther tanks. The problem with the KV-1 was that it was just too heavy. It grew even heavier with the need to add yet more armour to deal with the eventual improvements in German anti-tank weapons. The KV-1 got slower as it became heavier and the Army top brass argued that what they needed was more of the mobile faster T34 tanks that could keep up with the fluid modern battlefield of WWII's Eastern Front. The T34 had the same gun. It could deal out just the same amount of damage but move faster. The sloped armour of the T34, though not as thick as the KV-1 tanks armour, was still very effective. The first attempt to prolong the life of the KV-1 came with the KV-1S in 1942. It improved mobility by lightening the tank by five tonnes. This was achieved by making the turret smaller by casting most of it in one piece of metal and reducing the side armour from 90mm to 75mm. The redesigned turret made life easier for the commander. He no longer had to double as loader and he now had an all-around vision cupola. Despite these improvement it was outclassed by the German Tiger and Panther tanks in 1943. Its armour was now no match for the German tanks upgraded guns. It's 76.2mm gun could no longer penetrate the new German tank's armour. The final attempt to keep the KV going came with two major variants. The first of these was the KV-85 featuring a bigger turret originally designed for the IS-1 heavy tank and mounting an 85mm gun. The second was the SU-152 self-propelled assault gun mounting a 152mm howitzer mounted on the KV-1 chassis. The KV series of tanks days were numbered. They were under performing by 1943 and the new IS class of tanks that were being produced were better in every way. It should not be forgotten that in the first 18 months of the Invasion of Russia the Germans had nothing to match this large heavy tank. It's ability to sock up hit after hit whilst being able to steadily return deadly fire with its 76.2mm gun earned it a formidable reputation. In 1942 at Stalingrad, German and Russian tanks and infantry fought one of the bloodiest battles in history. It was the culmination of a year of fighting which started with the German invasion of Russia as part of operation Barbarossa. The Germans had been convinced that the weak Russian Army would collapse within 6-8 weeks. But the Soviet peoples red army fought their ground. This was not going to be another Poland or France. To capture this important centre or transport and industry the German High Command sent one of Army Group B’s best equipped mobile armoured forces. It included 300,000 battle hardened troops, 3,000 artillery pieces and 300 tanks. Stalin knew his army must make stand. The Soviet armed forces were very much under strength because of the fighting that had taken place trying to stop the German advance earlier in the year in which they had suffered defeat after defeat. Desperate to buy time the Russian 1st and 4th Tank Army was sent to Stalingrad. It had 200,000 infantry, 100 artillery pieces and just 258 T34/76 medium tanks and 40 KV-1 heavy tanks. Out-numbered the Russians fought a desperate rear guard action to try and delay the Germans crossing the river Don. On the 27th June 1942 the Germans advanced to the river to try and seize the main crossing. It was only 40 miles from Stalingrad. The Russian 1st tank Army launched a counter attack to try and stop them. The Germans had stopped in a village to resupply so as to be ready for the river crossing attack. Tank commander Lt.Vasily Krysov commanded a platoon of KV-1 heavy tanks during the counter attack. He recorded, "A series of green flares sored into the sky. The signal to start the attack. Our engine roared and our KVs moved out towards the enemy. It was beginning to get lighter and the Germans let loose a storm of fire." "One shell exploded about 20 metres in front of our tank. Almost immediately a shell glances off our left side. We start to zig-zag. Shells continue to bounce off our sides. Our tanks went out and received 15 – 20 dents from the German shells bouncing off." Russian tactics was always to form up in waves of tanks to over-power the enemy. They were sent forward as a massive hammer head not like the Germans who used armour as a flexible force. The Soviets used their tanks as a blunt hard hitting instrument. Two of the KV-1 tanks were hit and burning. Another was disabled as it had hit an anti-tank mine that damaged its tracks and wheels. German anti-tank Guns were being picked off the use of HE rounds. Some were crushed by being charged at and run over by the heavy KV-1 tank. Lt.Vasily Krysov KV-1 tank was now inside the village and had fallen upon the German panzers at close range. "It was a matter of spotting the enemy, turning the tank to face them and firing whilst stationary. It was very much like a duel of 100 years ago. The ensuing combat was fierce. A Panzer IV tank quickly moved in our direction. The German gun layer best us to the punch. Their shell hit our front armour. It did not get through, however when the German tank was hit by our shell it blew up." "Other KV-1 tanks were blowing up or setting fire to more panzer tank. We kept fighting for the next month at great cost to life but we kept the Germans back and delayed them reaching Stalingrad. This enabled more troops, tanks and supplies to be brought up to the city to fight them. I have been told we lost around 300,000 men and 1,000 tanks delaying the invaders." Soviet tank crew member Lt. Anatoly V Kozlov, 27th tank Corps recalls, "We were told to make two tank armys. We would defend the high ground. We could not let the Germans through. We had to stop them. All of us lived with that idea in mind. That was our task. "By the 21st August the 1st Tank Army had been nearly wiped out. 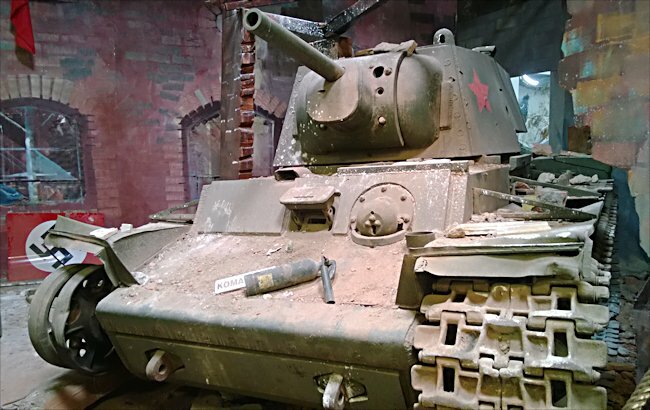 Where can I find other preserved KV-1 Tanks?